Somewhere along the line, we’ve all been convinced that grass is the only option for the lawn. But what if you just don’t have the desire or time to tend to fussy green grass? Despite how common the classic green lawn is all of our minds, it actually takes a ton of work and maintenance. You have to mow it and fertilize it, reseed any bald spots, water it often, especially if you experience long, hot, dry summers, not to mention the constant need to pull weeds. After all that TLC, you’re scared to even walk on it, let alone play or entertain on backyard grass. Ground cover, on the other hand, nearly always looks nice and often requires much less water. Most plants are relatively undemanding and, depending on the variety you plant, you may even see flowers at certain times of the year. Here’s why you should consider ground cover to replace all or part of your lawn. 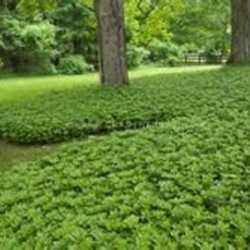 Groundcovers are any low-growing plant. The best plant species to use as ground cover will only grow a few inches high and tend to spread out at least a foot or more. Like grass, ground cover prevents erosion and help keep weeds from growing. 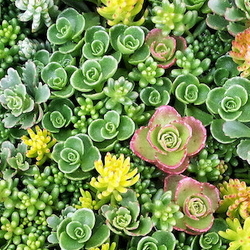 Unlike grass, groundcover offers a vibrant variety of colors and textures. Although you won’t necessarily want to play Bocce ball or flag football on it, it is a great option to add aesthetics to your outdoor spaces, especially if your property is hilly. In fact, planting ground cover on your hillsides instead of grass will better control erosion and eliminate the need to mow. Even non organic options such as turfing or artificial grass qualify as groundcovers. While it's rewarding to grow your own, artificial lawns have evolved considerably in recent years and are much more subtle, varied, and aesthetically pleasing compared to the neon astro turf of yesteryear. There are tons of benefits of ground cover over grass. For one, ground cover entails less work, especially once it’s established. Although it may be easier to roll out the green carpet, so to speak, on newly established lawns, it’ll still take time for that grass to become established. Plus, you’ll have to water, mow, and otherwise tend it throughout the process. With ground cover, you can plant, water it, and then let it do its thing. Way less fuss involved! 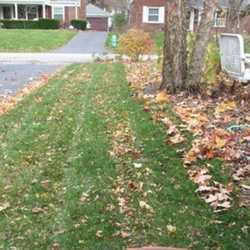 Groundcovers, like many grass alternatives, require much less water. You will still have to water them somewhat, especially in the first year or when it’s super dry in the summer. Set up drip irrigation, preferably on a timer, to make the process more efficient. The best part is, once the plants become acclimated and begin to spread out, it’ll cover your drip lines and make it so much easier to supply water to thirsty plants in times of drought. That all depends on your climate, soil, growing zone and whether or not the area in question is sunny or in the shade. Also, consider what you want out of the space. Are you planting groundcover to transition the areas around your garden or are you seeking to plant an alternative to grass? This will help you decide what to plant and where. Observe the site. Take note of the area you’ll plant the ground cover. Is it moist or dry? Is the soil sandy, loamy or clay? How much sun does it get, on average? Does water tend to pool there during the rainy season or is it the first area to freeze? Is it hilly or flat? Are there trees or shrubs planted there already? If so, what are they? Take out a notebook and write down your observations. For sun and moisture, it helps to recall certain times of the year. This a good general gardening tip, as having this information handy will help you make informed decisions about all of your planting.When you plant the right ground cover for the site, you can be sure that it’ll become established easily and remain healthy. Try to plant ground cover that is native to your area and you won’t have to worry about invasive varieties that’ll take over more than just the space. They’ll take over your lawn, garden and beyond. Animal and weed control. If deer roam through your property and pillage your gardens, consider choosing deer-resistant varieties, such as junipers, thyme and other scent-forward plants. As for weeds, you may still have to keep them at bay, especially in the beginning as the plants are becoming established. If you’re planting a new site, place a weed barrier down before filling the area with dirt and planting your ground cover. This will minimize the number of weeds in your garden and prevent airborne seeds from taking root. Can't Give Up Grass With Pets and Kids? That’s no problem. No one said you have to eliminate grass altogether. If you have to have some grass, limit it to a patch that your pets and children can enjoy. Or, reserve the side or backyard for grass. Although you’ll still have to maintain the grassy area, since there’s less grass to deal with, you’ll still save time, water and money. If you live in a neighborhood with an Homeowners Association (HOA), consider checking with the board to learn more about replacing your grass with ground cover. Many HOAs have rules about the topic. Learning what those rules are will prevent you from having to pay expensive fines.